Truly GREENhouses! | Our Farm by Earth Flora Inc.
62 responses to this post. Yes you can. Whatever you dream you can do, begin it! The more people farming and gardening, the better for our planet! I have a nursery of ornommental plants and i use classic greenhouse. I just have the idea of greenhouse built with bamboo and i search about this subject and I find your company made this innovation. Can you please give me more information about this bamboo greenhouse , which kind of bamboo where i can find it. Hi. Sorry for the delayed reply. I lost your comments in my dashboard. We use our local bamboo called “kawayan.” It is readily available in our area in the Philippines, especially in most areas around Northern Mindanao. We are not sure about its scientific name but it looks very much like the thorny Bambusa variety. Where are you from and where is your farm located? Hope I have been of help. Best regards. Hi again. I spoke with our farm manager who’s a native, he says the name of the Bamboo is BUNTONG. Thanks! Nice job! I have built a 96′ gh and i am using a water chiller to grow Lettuce in the Jungle in Fiji and plan to build a Bamboo greenhouse there next. Will soon tap a steam welltoo. Would anyone there like to help? Sounds like a great plan what varieties of bamboo is available there? I have been building bamboo geodesic domes for the past couple years, and what I really want is to create and indoor bamboo farm in colorado. I think I have a great vision for how to make a tall canopy greenhouse utilizing bamboo and rammed earth construction. I’m just looking for supporters, sponsors, investors. Let’s keep in touch? Yes please do keep in touch. It would be wonderful to share creative and practical ideas for the bamboo greenhouses. Let us know about your project and how it goes please. Best regards. I am a Norwegian man who is currently studying for a MSc in Entrepreneurship & innovation at SKEMA Business School in France. I am working on a project where I compare and evaluate different methods for constructing greenhouses in a large scale project. I find your bamboo construction very interesting. I wonder if you can tell me something about the construction costs? It would be great if you could tell me how large your greenhouse(s) is (/are) and what the construction costs were. I also wonder if you have any opinion about the lifespan of this construction? I really hope you can find the time to answer this request. Thanks in advance! Hi Paul. We’re happy our simple bamboo greenhouse is garnering interest from France! We just started using bamboo 3 years ago. Most of our construction materials came from our old greenhouses. We merely reused them. So, we don’t have a very good idea of how much it will cost to put up a new bamboo greenhouse or how long it will last. So far, it’s been 3 years and I have had no problems with the construction. We are still in the experimental stage but it looks very promising. Our greenhouses are 100 to 200 square meters and we estimate the cost of a new one would be between 8- 12 dollars per square meter. Please be in touch. Hi. Thank you for your response. I am interested in hearing more about your experiences later. Here is a link to another interesting bamboo greenhouse design: http://www.kyoto-u.ac.jp/en/news_data/h/h1/news7/2009/091005_1.htm Maybe something you can try out if you plan to construct more bamboo greenhouses :). Good luck with the continued running of your greenhouse and business! Brgds. Paul Chr. T.
Hi Paolo. Thank you for your comment. Most of the construction materials came from our old greenhouses, we merely recycled/reused them. 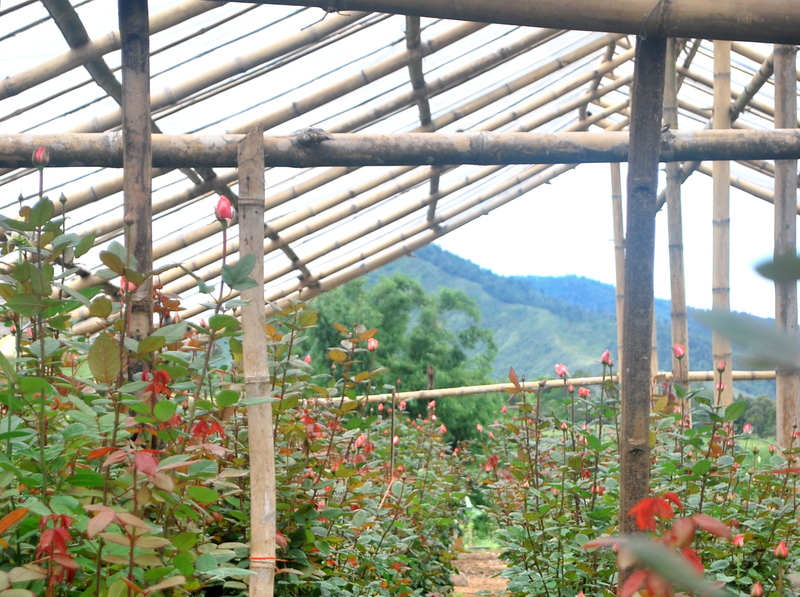 We do not have an exact amount of how much it will cost to put up a new bamboo greenhouse. Our greenhouses are 100 to 200 square meters and we estimate the cost of a new one would be between P500.00 per square meter. According to our farm manager, the bamboo is commonly known “BUNTONG.” Yes you can visit our farm. Just email us or send us a message when you plan to go. Great work. can you please sand me details on how to construct a green house using bamboo and the name of the type of nylons and the supplier and irrigation manufacturer address. I plan to grow vegetables. I will also appreciate if you can send me your email and number. I am based in Africa. Hi African Farmer. Thank you for your comment (all the way from Africa!) You can email us at nico@myflowerdepot.com. Nicolo can email you more on what he did for greenhouse construction and what he used to do it. Thanks! What material did you use into the ceiling of your greenhouse plastic or glass??? Hi. We use Greenhouse Plastic Film. It is more practical and less expensive than glass. Thank you for the useful information about an inexpensive greenhouse construction…but i am wondering what you have used for the upper covering it is a glass or plastic?? If it is plastic where could i buy them…..Thanks!!! Hi. We use Greenhouse Plastic Film. I’ll give the contact details in my next reply. Will have to get it from the shop. Thanks! I am in central Louisiana and have bamboo growing on my property. I plan to build a lean to greenhouse and want to do it as inexpensive as possible. Will our bamboo work? How should I cut it? Should it be cured? Hi Penny. We grow and use mostly thorny bambusa here in the Philippines . We cut from the bottom of the trunk since this is the hardest part and very good for post. We cut at the right age , this is when the bamboo will start to have like a white powdery substance around the lower portion of the trunk. To treat bamboo we use borax and boric acid there are videos on youtube you can check on treating bamboo. I hope this helps. I live in Ga. I use uncured bamboo with recycled plastic film from commercial greenhouse grower in the area. My structures are crude and not so large,but they serve the purpose,outlast the plastic film and are simple construction[wired together arches and poles].my local bamboo is smallish and i twist tie 2 stalks together small end to small end to make the arches. I use a ‘button’ and tie method for securing the plastic.If you want exposed bamboo to last over 1 to 2 years, it must be cured,a rather time consuming and labor intensive process,and must be treated with borax/boric acid or some other means.For strength the bamboo should be 3 to 5 years old,generally will be yellow colored for most i have seen.Hope this helps. Hi Wayne. Thank you for your comment it is most helpful! Our bamboo is the local thorny bambusa variety. We select the ones that have the white powdery layer close to the bottom of the poles. These poles are at least 2 years old. We also use borax or boric acid to treat the bamboos. Such great work Nicolo….. it’s so inspiring for you to share these….galing!!! Very nice construction and reconstruction. Are you also using bamboo pegs to hold the greenhouse film in place? Hi. We don’t use bamboo pegs to hold the greenhouse film. We use nut and bolts. Absolutely LOVE your work. Your farm is an inspiration and I very much hope to achieve my own little bio dynamic farm one day soon. I was looking at some of your farm pics on flickr and was interested to know how/if you secured the bamboo poles into ground, and if so about how far did you secure them in the ground. Thanks I really enjoy your blogs, they are so informative and useful. Thank you also for your appreciation! The more of us doing biodynamic farming, the better! We secure the bamboo pole by scorching it and then boring it into the soil. We bury it to a height of about 1 to 1.5 meters (this will often depend on how high you want your poles.) To finally secure it, we pour a a minimal amount of concrete into the hole. Hope this helps! tks for the interesting info about bamboo greenhouses you have built in Philippines. I work on Timor island, Indonesia and am very interested in building this especially when the rains come and no tomatoes or other vegetables are available for several months per year. What is your system for catching rainwater? Thank you for your comment. All rainwater we get from the greenhouses are channeled to a water impounding pond or to the plant beds covered with thick mulch to avoid evaporation. Hope I have answered your question. Hi Jeffrey. What is your email address? Send ko dun ang detailed na proseso. Salamat. Hi, I would like to know can i structure a Green house with Bamboo on my terrace which is over the 3rd floor of the building and is 60feet *40 feet which is 2400 squire feet ground area. I am worried if it could take the wind speed at 120 km per Hr. Hi. I think it can handle the wind if you build it not so wide, for example 3 meters width and 6 to 7 feet high with vent in the middle? I loved your article. I am planning on building a greenhouse in the USA. I think it is an amazing idea and recycles what we already have. I am seeking information on putting the greenhouse togeather and how to “seam” the top togeather. I was hoping to make about a 12×24 size. We are looking to build a new bamboo greenhouse. I was wondering how your greenhouse is faring- how many years has it been standing? And why did you use bamboo pegs versus nails, besides I suppose sustainability? How tall is your green house? Do you have any vents in it? Did you position your greenhouses in a special way toward the sun or any consideration to wind? Enjoyed reading about your farm. Hi Rose. Nice to hear from a farmer in panama. We have been using the bamboo greenhouses for 5 years. It can last longer if you make smaller greenhouses. We used bamboo pegs instead of nails. Apart from sustainability, the pegs allow the bamboo to sway with the wind. It’s perfect for our tropical weather, where somethings the winds are very strong. Our greenhouses are about 8 to 10 feet tall. Yes we have vents in it. We have open sides and vents in the middle. We positioned the greenhouses more for wind direction, we made sure the structures faced the wind. Hope we answered your questions! I indeed admire your bamboo greenhouses. How did you attach the covering sheet without nails? Hi Stephen. We just use screws and bolts. Hope this answers your questions. Thank you for your message. It is best to go to Agrilink because you will find several suppliers there and you can get the best prices. I think Agrilink has a list of companies that participate in the event and you can check it online. Can we visit your place? Where is it? hi. i’m glad to read this article because i am also into organic gardening. it gives me an idea for my garden. i do have one problem in my garden, though. it is infested with subterranean termites but i do not want to use commercial pesticides. i read somewhere that boric acid kills this pests. could you tell me where to buy this boric acid? it is not available in local drugstores, grocery, hardware and agricultural stores in the cities of iligan and cagayan de oro. or maybe i will just buy boric acid from you. is this possible? Thank you Elmer. Some agricultural stores sell boric acid but in liquid form. You can try this. They are available in most agricultural supply stores. We just built a chicken house out of bamboo – works very well ! Ask ko lng po kung san makakabili ng plastic na pantakim sa greenhouse..and mgkano kaya?? We do not sell the plastic sorry. You can find it in stores selling agriculture or plastic supplies. It’s UV film. Do you have complete design and measurement of the your greenhouse.because we want to start our flower garden to in Nueva Viscaya,We are both OFW..pls we support and knowledge about Greenhouse and planting of flowers. Hi Mario. We might be giving a workshop/training on bamboo structures. We will let you know when we have a schedule. I have standardized the ‘Bamboo Greenhouse technology’ as well as the models of 200, 400, 600, and 960 sqm size. 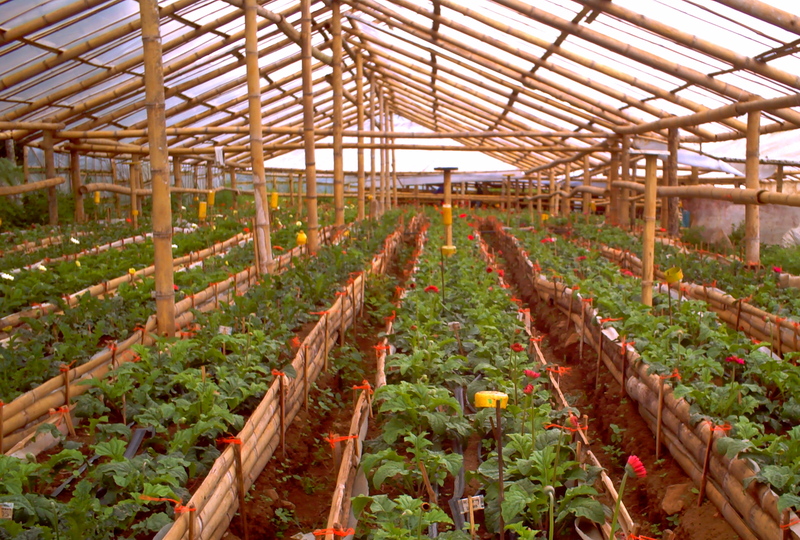 This structures are suitable for sub-tropical crops where Hot & Humid climate prevails. However it can be customized. Thank you for your offer. There are a lot of interested farmers. Hello Po, isa po akong tagahanga sa inyong Greenhouse method. Just few years we acquired a Farmland sa province po namin sa Negros may portion sya na elavated yung area, have also some Mangos and Coconut trees are there, as of this time gusto po sana maglagay ng Greenhouse sa tulad sa inyo na gawa ng bamboos, is that possible po? First po namain ang humawak nang Farmland kaya no how po talaga kami. Madaming salamat sana mabigyan mo ako ng konteng idea how to engage in farming….thank you and more fruitful blessings pa more. Hi Vicky. I am sorry for the late reply. I am from Negros too. 🙂 We can help you with your greenhouse set-up. What do you need help with? Hi! I would just like to inquire if you are providing services for greenhouse construction? My boss wants to build a greenhouse at their Silang, Cavite property and we are currently looking for someone or a company that could help us in building it. Will you be able to help us? Thanks in advance. Thank you for your interest. We will be emailing you. I can provide you the technology to create a far better quality ‘Bamboo Greenhouse’ innovated by me. Tis was awarded by IIGP and presented in 1st GFIA at AbuDhabi in 2014.